If Pride & Prejudice taught us anything it is that one should not leap to rash conclusions based on a one-sided account. So it is convenient indeed that this week has seen Austentatious approached from two very different perspectives. First up The Times, who tackle the irrepressible rise of UK improv in an article marking the upcoming launch of the Bristol Improv Theatre, the first venue in the country established to showcase solely unpremeditated dramatic delights. If that’s one explanation of our unique appeal, quite another is offered up in a brand new book, Marina Cano’s Jane Austen & Performance. 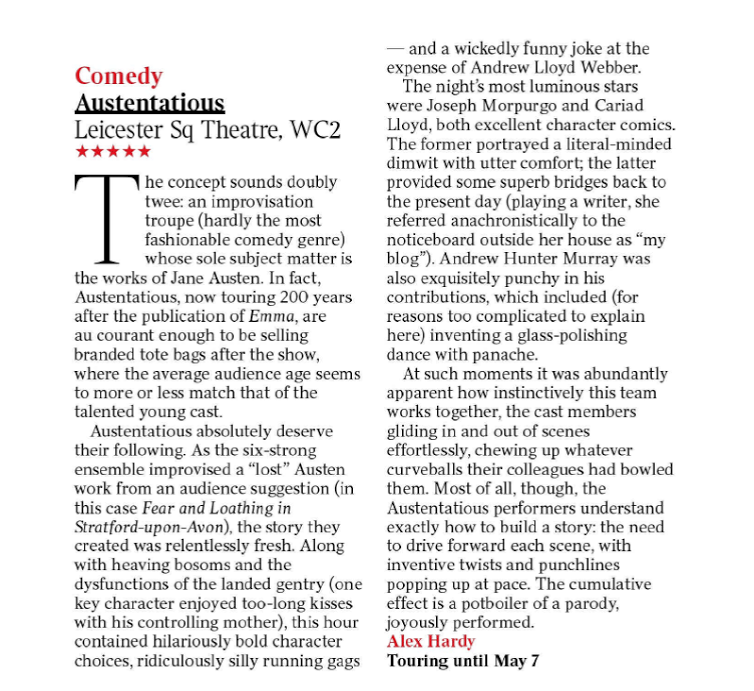 It is flattering indeed to be considered “a good closing example of the eminently performative and theatrical force behind Austen’s stories”, although we do fear the impact of the literary-Inception triggered by our show about Austen being analysed in the same manner as our source material. Through their flawed imitation of Austenian tropes and stories, Austentatious exposes the imitative nature of the Austen phenomenon: the actors frequently quote the screen adaptations—in their frequent inclusion of a final kiss and their use of the soundtrack of Langton’s BBC miniseries in their promotional video. Paraphrasing Butler, Austentatious’s parodic recitation of Austen reveals that performance is to source text not as copy is to original, but rather as copy is to copy. So is improvising Austen akin to a collective narcotic buzz, or a perspicacious exposition of “the imitative nature of the Austen phenomenon”? We expect it’s a bit of both. Now before we get cold turkey, we’re off to Caterham tonight, for another hit of purest Jane.